Well, I had my ultrasound yesterday (Wednesday), and we found out that our baby is a GIRL! I am in shock. I thought for sure it was going to be a boy--I had no doubt. I'm pretty sure Andrew was counting on a boy, too. Imagine our shock when the ultrasound technician said that we are having a little girl! Of course, I am very excited. I grew up with one sister and we are extremely close, so in my opinion, girls rock! But every time I go to Babies R Us I look at boy things, and we have discussed a few boy names. But girl names and girl stuff? Never crossed our minds! We have a lot of planning to do. I think Andrew might be slightly disappointed, but I am beyond excited. By the way, we had some blog issues in the wee hours of the morning. 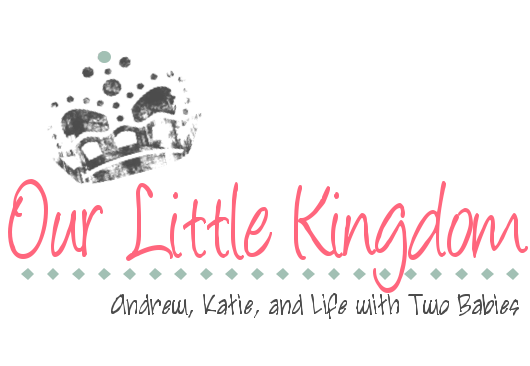 Andrew was doing some work online and accidentally deleted our blog! (I had no idea that one could do this.) We have put all the posts back up, but we obviously lost the comments that everyone made about the posts and we have lost the "boy or girl" poll. Oh, well. All of this happened in the middle of the night while I was sleeping and Andrew had fixed most of it by the time I woke up this morning. He is a computer genius. 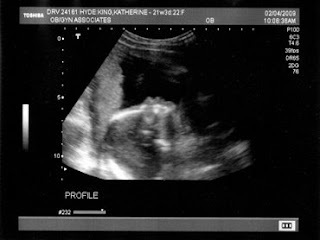 Following is an ultrasound picture of our little girl. She was very curled up yesterday and didn't feel like moving, so we didn't get any pictures of her face. I guess she wasn't in the mood to have her picture taken--a true diva! Luckily, the pictures are labeled, because Andrew and I don't think that the pictures look much like what they apparently are. Hopefully she will look more like a baby and less like an alien by the time she is born.